Runners Connect » » Marathon Nutrition Marathon Long Runs: Empty Stomach or Fully Fueled? Marathon Long Runs: Empty Stomach or Fully Fueled? Running coaches and exercise physiologist have long debated the potential benefits and possible disadvantages to performing long runs during marathon training on an empty stomach or fully fueled. Unfortunately, scientific literature hasn’t provided runners with a clear cut answer to that question. However, by looking at the available evidence, and combining that with practical examples, we’ll show you how you can use both in your training to maximize performance. One of the most important determinants of marathon success is how efficiently your body can use fat as a fuel source as opposed to carbohydrates. The more readily you can burn fat while running at marathon pace, the longer your glycogen stores will last – providing crucial energy for that last 10k. You should run your early training segment long runs in a glycogen depleted state. This will teach your body to boost glycogen stores and increase fat as a fuel source early in the training cycle. However, because the long runs won’t be too long, you don’t run a high risk of bonking and sacrificing a critical 20 or 22 mile long run. Run your last 3 quality long runs in a glycogen loaded state. In doing so, you will increase the overall quality of these important long runs, enabling you to finish faster, and recover more quickly. Likewise, you can practice your marathon nutrition strategy to acclimatize your stomach to processing simple sugars and fluids efficiently. By implementing both glycogen depleted and glycogen loaded long runs, you can improve the critical fuel efficiency element of the marathon while maintaining consistency in your training. Do you have questions about how to incorporate these types of long runs in your training? Just ask one of our coaches and we would be glad to help. Burke, L. (2007). Nutrition strategies for the marathon: fuel for training and racing. state. Journal of Science & Medicine in Sport, 13(4), 465-469. Great advice! I actually ran my early long runs without much food only because during a 10-11 mile run I don’t normally need it. It seems to just move around in my stomach and makes my run kind of miserable. Also, just having an energy drink or water on an empty stomach and heading out the door for a run wasn’t the best idea either; no food and that fluid was just sloshing around. You definitely need to experiment before your race and that is what long runs are for, especially those 20 milers, definitely needed replacement for those runs and you find out what works for you. No experiments on race day! Hi! im training for chicago and right know im doing long runs of 14 miles on saturday. Im traying to include some trainings running on empty. Im usually running 10 k and i feel great. Do you think its beter to try running on empty in the long run? I think now is a good time to try. I would bring some fuel with you, just in case, by try running on empty stomach and without gels/food. Just have them as a backup in case. Great advice Jeff. I remember Nate talking about this in your interview with him. Great article! Thank you for providing a different perspective on “carbo-loading.” I’m currently training for a full marathon (in fall), and would love to train my body to use fat efficiently. Could you kindly elaborate on running on an empty stomach? Does it mean just skipping breakfast? Or also having a low-carb dinner the night before and refrain from taking too much fuel doing my run? Thanks in advance. 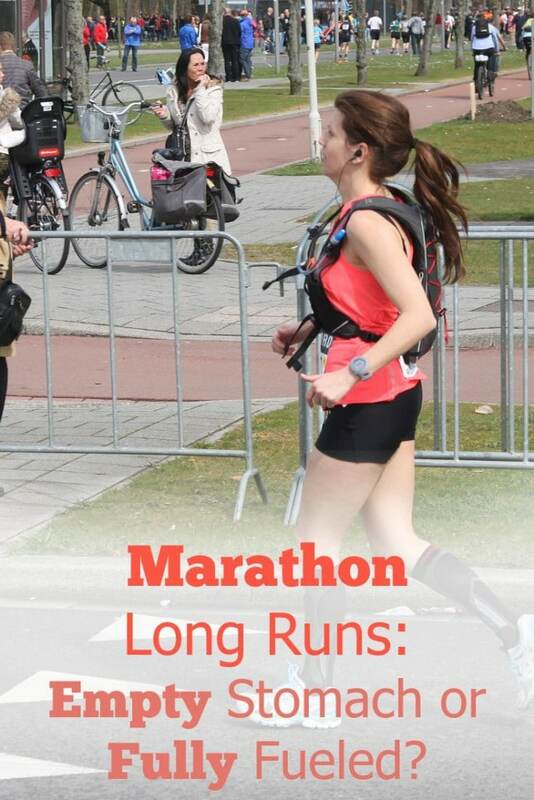 interesting article, I still have problems as to how to fuel for 1/2 marathon or above. I have oatmeal and a banana before race but have trouble with what to have during race. I do ok for first 1/2 of the half marathon and then about 7 miles I start feeling rough… gels, gu irritate stomach, just water does not work and can not drink gatorade, propel… last race I felt really nauseous at end of race and had bowel issues. I have found that I actually feel better running in the morning on an empty stomach. I ran 14 with no food and just one GU this last weekend. I wonder if I should go into a marathon just like this with something small to eat around 12-14 miles like a Luna bar. I would hate to blow my training on a food issue. I also have been Gluten free for 4 months and found that recovery is quicker and I feel a lot better in general.